940 students see "Accidents Disappear" - Broad River Electric Cooperative, Inc.
Over 940 students had an interesting lesson in electrical safety on Wednesday, March 20. 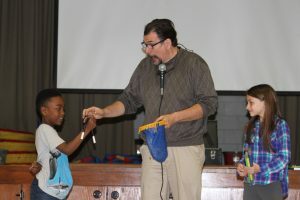 Using magic tricks and comedy to entertain while educating, magician Chris Dixon presented his Making Accidents Disappear program. The program teaches students to be aware of their surroundings, especially when electric wires and appliances are nearby. This is the seventh year that the show has been sponsored by Broad River Electric Cooperative The show was “on tour” this year, performing at Jonesville Elementary-Middle, Blacksburg Elementary, and New Prospect Elementary, and the Upstate Family Resource Center.